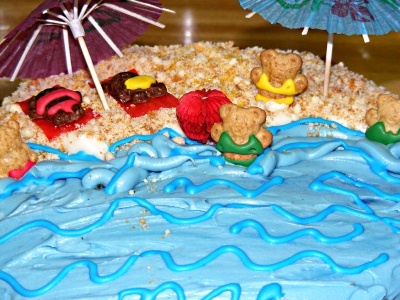 What a coolocean cake with the cutest details, teddy grahams in swim suits, beach umbrellas, and goldfish! 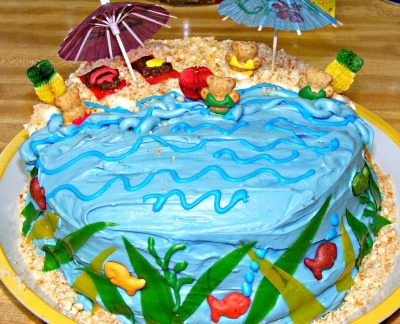 This would make the perfect cake for a beach, ocean or luau themed kid birthday party. Parasols and sand (sugar) lined beaches with blue icing waves. Seaweed cut from colorful fruit roll ups and colored goldfish swimming around the cake. What a creative use of teddy grahams! Thank you Amy for sharing this wonderful cake!